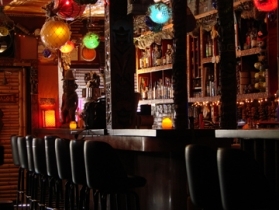 Structure has carried neighborhood taps and now Milwaukee's go-to Tiki bar, Foundation. For decades the building that is now Foundation served as a neighborhood tap for the working class Poles who lived in the vicinity of E. Center and N. Bremen streets in the Riverwest neighborhood. With the family living above, and working in, the tavern below, such places were community magnets and provided stability to the neighborhood. Some owners ran their places for decades, and that has been the case here, more than once. Much changed in the late 1970s and early 1980s, when the old folks died out or moved away. As recently as that time there were over a dozen bars two blocks south on E. Wright St. Today there are but two. Most of the bars that survived have changed their focus to a younger crowd, yet their interiors still look pretty much the same as when grandma would come by for her schnapps. One exception is the Foundation, which took on its present name in 1995 when it opened as a bar with a skateboard theme. 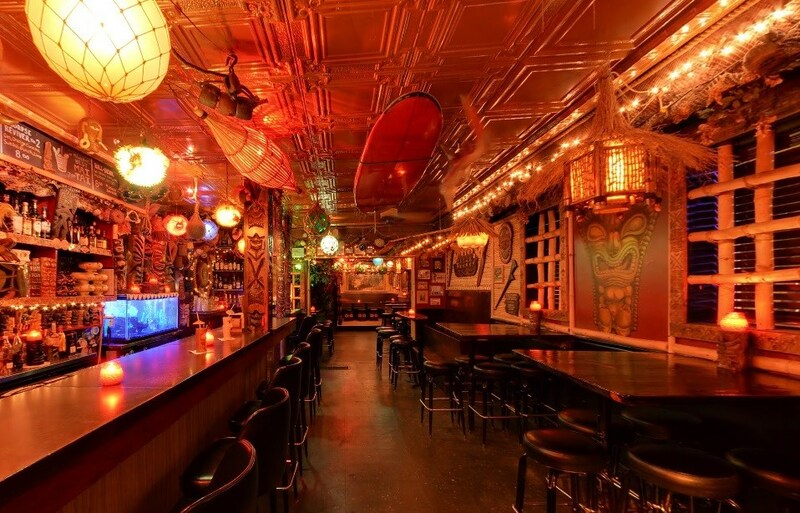 That got old, as did the skateboarders, and the tavern has undergone a ever-evolving iteration as a Tiki Bar — one that is gaining a wide reputation and has become a tourist attraction for this old neighborhood, while still retaining a cadre of local regular customers. Fish Tank. Photo by Michael Horne. 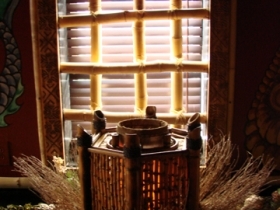 It was announced earlier this year that the apartment above, also decorated in a Tiki theme, would be available for rent as an Air B&B unit. On the inside, you will not be distracted by televisions or tacky bar signs. However, there is an abundance of items to catch the eye, including genuine and reproduction fish net floats. (The cheap ones have been converted into attractive lamps.) 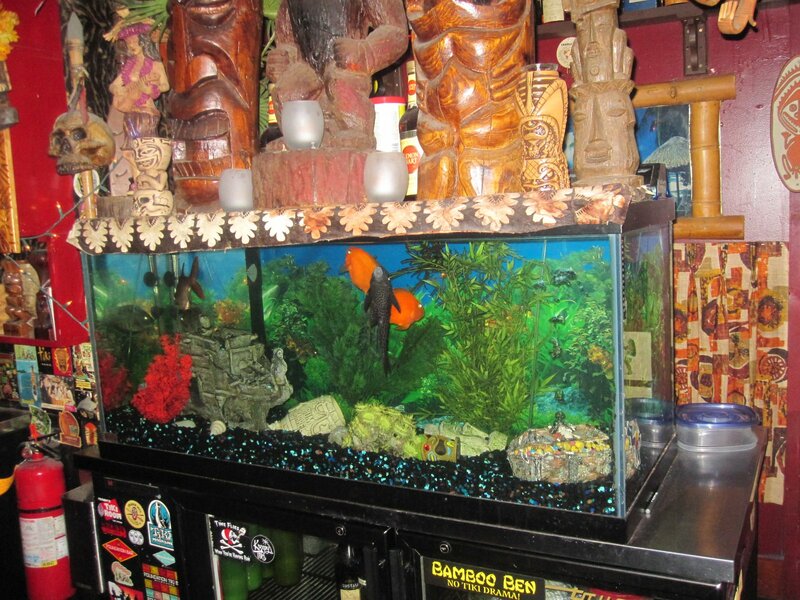 Wood and bamboo carry the design theme here, and a tropical fish tank has a place of honor behind the bar, right with the deluxe rums. 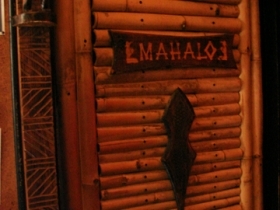 Even the draft beer is dispensed from its own little tiki hut. 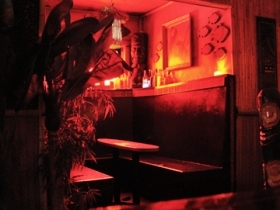 The ambience is cozy, and possibly even romantic if you bother to bring a date. About the foundation of the Foundation: It is brick, and it was laid in 1893 at which time the top floor of the current building was hauled to this site, and a new first floor was built beneath it. Jon Gunzkewitz, a building mover, took out a permit on March 25 1893 to relocate the frame structure from “From block 20 Ward 6 E. Side Commerce St.,” according to the handwritten record. 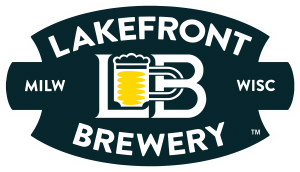 Today that site lies beneath the Holton Viaduct, adjacent to Lakefront Brewery. The bridge dates to 1926, but it was the successor of a short-lived span built in 1894. Presumably, the small building was in the right of way of the bridge construction, and it was worth the $500 to move it to what was then 1054-Bremen St.
Once at its new location on “Lot 22 block 5 ward 13th,” R. Kolinski, the owner, took out an alteration permit on April 19th, 1893 for an $850 project “to repair present building and … build a story underneath.” That gives us the foundation and the current first floor. Ten years later, on May 9 1903, Joe Zakzewski spent $600 to “Add 20 x 30 10 ft studs and brick basement 14 x 20 x 7 ft high” to the rear of the building. Four years later, in September, 1907 Joseph Jakrzewski spent $500 to “Build addition 12 x 22 x 12 studs set on brick foundation, not to project over lot line. Erected and (sic — an) additional story to rear part,” according to the permit file. This gives us the back room. The upper floors of the building housed living quarters for the family that operated the tavern below, and the regular additions indicate a growing family and a good trade downstairs in the tavern. The property, bounded on the east and the south by alleys, accumulated a number of small structures in the rear, although none as habitable as the rear cottages that dot the lots of Riverwest. These were more of the coop, shed and stall type structures. Riverwest went garage crazy in the late 1920s. Unlike the east side, the neighborhood was platted with alleys as an integral part of the street fabric on nearly every block. One by one the family gardens of the Polish settlers disappeared, and houses for automobiles took their place. Riverwest has perhaps the most diverse collection of garages in the city, and some, like this one, were converted from barns. In July, 1934, Ziem took out an occupancy permit to run the place as a tavern. The former use of the space? “Tavern,” he replied. It remains its function to this day. By August 8 1952, the place was known as Frank & Gin’s Tap. In April, 1956 a new Schlitz sign was erected on the building, and owner Genevieve Wojciechowski, who lived upstairs, got tired of all the racket from the customers down below. Genevieve also took out a permit to “Provide new front door. Must swing out.” This change complied with the Fire Code, and can be seen in the inset entrance to this day. At that time, The Perma Stone Corp. applied its product to the first floor of the building, with 18 inch returns on each side of the building, adding aluminum siding above. The $800 project was done without a permit. The inspector came around and busted Genevieve, who had to pay a double fee for her disregard of the ordinance. On September 10th, 1961, children playing with matches set fire to the old barn / garage, with damage of $2,000 to the building and $50 to the contents. “Total loss — owner will raze. Condemned. No service,” the inspector noted. At this time, the complex consisted of the tavern, one apartment and two “sleeping rooms” above, with Wojciechowski firmly in control. Genevieve’s bad luck in finding a tavern operator continued. On November 24th, 1976 Charles F. Kimble‘s hopes to run the place were dashed by the plumbing inspector. “Defective bar sink. Defective bar waste plumbing,” the inspector wrote. Furthermore, Kimble was refused a tavern license. The tavern remained vacant, yet Genevieve renewed the license for four years, which is the prudent thing to do when your use of a building, although legal, does not conform to current zoning. On December 8th, 1980 Meredith Ackley got a certificate of occupancy for the tavern with a maximum capacity of 50. By 1982 the owner was Jerry Krier, and he operated the place as J. L. K’s Fortress, yet with a capacity of only 25. On August 31st, 1995, Charles Herlitz and Kenneth Witkowski took out a certificate of occupancy for the Foundation, with a capacity of 80. In 1997 a non-load bearing partition was removed to enlarge the opening to the rear room, and in 2001, a new bathroom was put into the place. 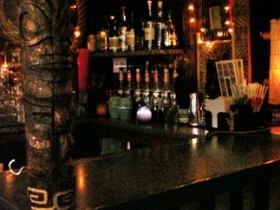 In 2017 it was announced that the apartment above would be turned into an Air B&B, with a Tiki theme to match the bar below. Description: Old tavern was moved to site in 1893. Was typical neighborhood bar until its conversion as a skateboarder hangout in 1995. 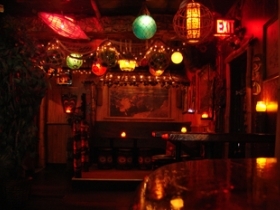 More recently, it has been a Tiki bar, with no end of odds and ends in the warm, inviting interior. Despite the gloss, it manages to maintain a neighborhood feel, and continues such Riverwest traditions as a good, long, happy hour. Year Established: Has been a tavern since the 19th century, and served as a licensed Soft Drink Parlor during Prohibition. Was closed for four years at the end of the 1970s. but owner maintained license during that time. Year Building Constructed: The top floor, of unknown vintage, was moved to the site in 1893 at which time the lower floor was added. Subsequent additions in early 20th century. Estimated Annual Rent: 1,322 square foot tavern @ $8.53 per square foot = $11,276.66 according to Assessor’s calculations. Operator owns building. Walk Score: 86 out of 100. “Very Walkable.” Most errands can be accomplished on foot. City Average: 62 out of 100. Transit Score: 54 out of 100. “Good Transit.” Many nearby public transportation options. County Supervisor District: 13 Willie Johnson, Jr.
Bike Racks: Yes, a number of them between the building and the alley. I didn’t know that The Foundation went back to 1893! Great research, as usual, Michael Horne! The FOUNDATION bar was owned by my grandfather Vincent Ziem and my father Stanley Ziem along with his sisters and brothers occupied and were raised in the living quarters on the second floor and they used the attic as a bedroom. My grandfather Vincent died of a heart attack in his sleep in the attic. I was born in 1938 , a year after Vincent passed away but my grandmother Martha still owned it and my Dad brought me there. I recently flew from California and I took my sister from Chicago to Milwaukee to see the old family homestead, THE FOUNDATION”. Unfortuneately we arrived at noon but we couldn’t get inside because them TIKI bar didn’t open until 4:00 PM and we couldn’t wait. I wish to this day I could have gotten in and seen my family’s old “house”. The stories about the place told my father about the history were outstanding . Tom Ziem , Laguna Hills, Calif.